• The Bank has successfully passed a rigorous external evaluation process backed by AENOR and the Club Excelencia en Gestión. • CaixaBank is currently the only Spanish bank with six business divisions certified according to the AENOR Conform framework: Banca Privada, Banca Premier, Banca Particulares, Banca Negocio, Banca Internacional and Banca de Empresas. • Thanks to its management model, CaixaBank has been appointed Ambassador of European Excellence 2018 by the Club Excelencia en Gestión. 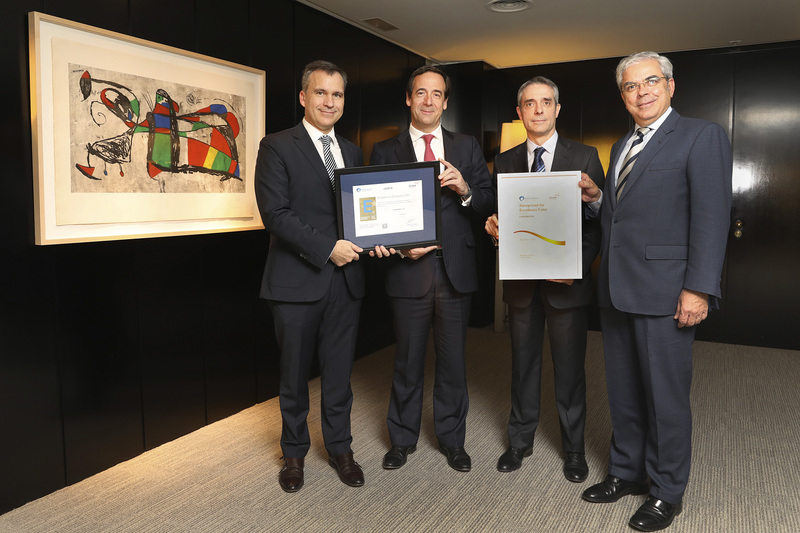 CaixaBank has obtained the EFQM 500+ European Seal of Excellence with a score of over 650 points. The Bank has successfully passed the rigorous external evaluation process backed by AENOR and the Club Excelencia en Gestión, and it has improved on the score obtained in the previous review. In doing so, the Bank has consolidated the path it began in 2012, when it achieved this recognition for the first time, having consistently renewed it every year since then. Gonzalo Gortázar, Chief Executive Officer of CaixaBank, and Bibiano Martínez, Executive Director at CaixaBank, have received the EFQM 500+ European Seal of Excellence certification from Rafael García Meiro, Managing Director of AENOR, and Ignacio Babé Romero, Secretary General of the Club Excelencia en Gestión. Gonzalo Gortázar highlighted the importance of the seal, a recognition that certifies the financial institution's implementation of a high-quality management model in accordance with international standards. As the chief executive officer of CaixaBank pointed out, “the EFQM 500+ European Seal of Excellence is a key tool for generating improvements in the organisation, and this level of quality and excellence demonstrates our firm commitment to leadership in management and the highest quality standards”. Furthermore, Bibiano Martínez explained that “a recognition like the EFQM 500+ European Seal of Excellence is essential for an organisation like CaixaBank, which aspires to anticipate customers' needs and understands digitisation as a way to accelerate the improvement of processes and services. The ultimate goal is to offer customers the best experience, as set out in CaixaBank's Strategic Plan for 2019-2021”. For Ignacio Babé, “the commitment made by CaixaBank in 2012 to the EFQM Model of Excellence, as a management model and a tool to implement continuous improvement, has been rewarded today with the renewal of the 500+ Seal and the consolidation of a score above 600 points. CaixaBank has successfully addressed the constant changes that the banking sector must face, largely thanks to its resolute commitment to risk management, the deployment of the Compliance model and high-value proposals that focus on different customer segments, thus guaranteeing sustained success over time”. According to Rafael García Meiro, “for any organisation with leadership ambition, the trust it instils in its target audience is key. In financial services, this element is particularly important. CaixaBank is a global benchmark and it makes the implementation of management systems and their subsequent certification a part of its competitive advantage. The Bank has made a resolute commitment to the certification of its business models in the various market segments in which it operates, placing the focus on the customer; all of this, without forgetting that CaixaBank's values (quality, trust and social commitment) are the foundation for Integrated Management Models”. To carry out this evaluation process, which has involved more than 300 of CaixaBank's professionals, AENOR has visited CaixaBank's central services, branches, business centres and private banking centres in several Spanish cities and has evaluated the Bank's different teams. For AENOR, of particular note is the way in which CaixaBank has developed a customer-centric management model, as well as its innovation and digitisation strategy that allows it to promote more digital processes and new services. Furthermore, the Bank's financial robustness and the excellent results of various projects aimed at accelerating efficiency were highly valued in the EFQM 500+ certification process. 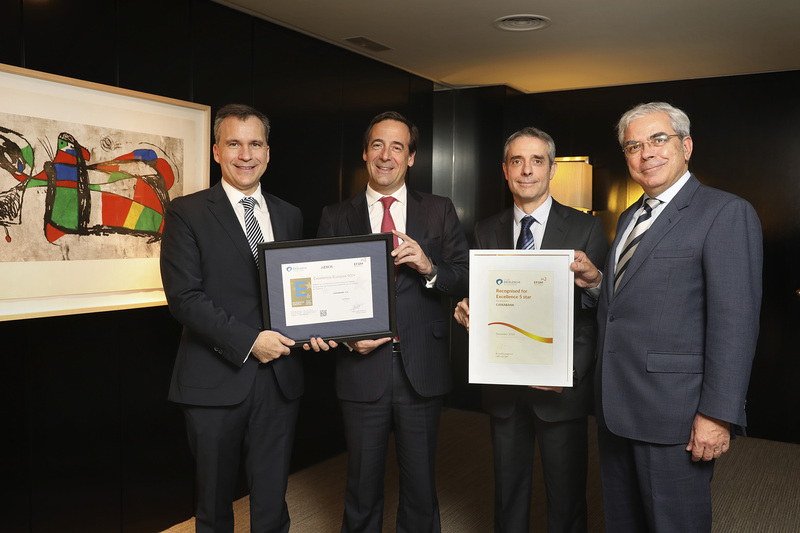 The recognition by AENOR and the Club Excelencia en Gestión joins the AENOR quality certification awarded to CaixaBank Private Banking last summer for its business model and customer relationship. As such, CaixaBank is the only Spanish bank to have six business areas that hold the AENOR Conform certification for their customer relationship model: Banca Privada, Banca Premier, Banca Particulares, Banca Negocio, Banca Internacional y Banca de Empresas. In addition, thanks to its management model, CaixaBank has been appointed Ambassador of European Excellence 2018 by the Club Excelencia en Gestión, a recognition to organizations that hold a valid EFQM Seal with a score of 600 points or more. In this way, the Club Excelencia en Gestión seeks to distinguish organizations, such as CaixaBank, that strive to be better every year, using the values of excellence and the recognition system based on the EFQM Model of Excellence. CaixaBank is the leader in retail banking in Spain, with a 29% market share among individual customers. The bank, headed by its Chairman, Jordi Gual, and led by CEO, Gonzalo Gortázar, has around 16 million customers in Spain and Portugal, with 5,176 branches, the largest commercial network in the Iberian Peninsula. CaixaBank has been chosen as the best Spanish bank by some of the most prestigious specialised international publications. In fact, it was named Bank of The Year in Spain 2018 by the British magazine The Banker of the Financial Times Group, and Best Bank in Spain 2018 by the New York magazine Global Finance. Similarly, Euromoney also named CaixaBank the best private banking entity in Spain in 2018 for the fourth consecutive year, and has, for the first time, selected it as Western Europe's Best Digital Bank. Considered one of the world's most sustainable banks, CaixaBank is included on the Dow Jones Sustainability Index and is part of the CDP A-List, which singles out those companies leading the fight against climate change. AENOR is a professional services company that identifies and helps to close competitive gaps between companies, sectors and in the economy in general through generating trust. AENOR is the leading certification company in Spain. AENOR is a global company with operations in 90 countries in the fields of certification, verification, validation, inspection, analysis, training and information services. In Spain, it has a network of 20 offices. Currently, over 80,000 work-centers hold an AENOR certificate, in fields such as Quality Management, Sustainability, Occupational Health and Safety, Digitalization and Compliance. AENOR's competitive advantages include the highest brand recognition among companies (B2B) and companies to consumers (B2C); having its own staff, which allows it to manage the accumulated knowledge for the benefit of its clients; innovating to resolve new competitive gaps through its proximity to sources of knowledge; and its geographical and sectorial scope. The Club Excelencia en Gestión is a business association founded in Spain in 1991. Its mission is to help organizations to improve their management processes, thus contributing to their success over time. It offers its members, and wider society, the opportunity to improve their organization's management processes and results, to connect with other professionals and to extend their network of contacts, to give their organization visibility and to be recognized for their achievements and excellent results, so that its members can become benchmarks for their excellent management processes. It is made up of 230 members, from a wide range of sectors and of various different sizes, that currently represent 20% of Spain's GDP and 25% of the IBEX35.